The Northland Prep Spartans wrestling team has a few young members of its roster stepping up and making strides in hopes of earning an eventual spot at the state tournament. 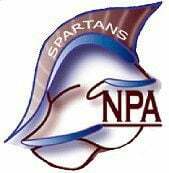 The Spartans went 1-3 at a multi-meet the team hosted on Tuesday, the last time this season Northland Prep will unfold its mats in its own gym. Leading the way were Kobe Yazzie, Alexander Yamamoto, Johnathan McGrew and Liam Cashmore, who all ended the meet that included Tuba City, Holbrook, Winslow and Pinon with at least one pin to their name. "We have three or four wrestlers who are looking pretty good and we are hoping they can qualify for state," said Spartans head coach Ben Stanton. The Spartans lone team win came over Pinon, 66-12. All of the teams at the meet were Division IV, Section Four programs, giving Northland Prep an idea of what the competition at the level looks like heading down the final stretch of the season. In his first year with the team, Yazzie has stood out as a force in the lightweights. On Tuesday, the 120-pound freshman won his first match against a Holbrook wrestler on a 3-2 decision and pinned his Winslow and Tuba City opponents. His other win came via forfeit. McGrew, wrestling at 138 pounds, started the day off on a tight decision loss, locking horns with his Holbrook foe on the way to a 6-5 loss. He responded with two falls, getting the best of his Winslow and Tuba City foes, and he won on a forfeit against Pinon. McGrew and Josiah Stuart were honored as the team's lone seniors at the home match during Northland Prep's bye. Yamamoto, also a freshman, kept his season going in the right direction, getting pins against Tuba City and Winslow after starting off a loss by fall to Holbrook. He wrestled at 132 pounds. Stuart dropped both of his matches by fall, as the others were forfeits. "We still need a lot of work, especially because we have all these new wrestlers," Stanton said. "We have some who have come along really well, some are still making first-timer's mistakes that are getting them in trouble." Cashmore also had a solid day at 160 pounds for the Spartans, who only wrestled at home twice this season -- the first being an exhibition against Flagstaff High. The junior won by fall against Winslow, had a 6-2 victory by decision against Tuba City and had forfeits in his other matches. Holbrook beat Northland Prep 39-33, and Winslow beat the host 48-30. Tuba City also beat Northland Prep, 42-33. "I was hoping we would do a little better, but we are there in the matches," Stanton said. Led again by Pedro Billups, the D-III Panthers finished 10th out of 20 teams at the Brad Jones "Pack" Invitational that ended on Saturday at Centennial High School in Peoria. But Billups lost his first match of the season in the title round of the 113-pound weight class, moving to a 38-1 record. He lost by an 8-2 decision. Billups had three pins on the way to the championship round. Tony Hernandez at 106 pounds finished fourth for the Panthers, providing his team 52 points to trail only the 66 Billups accumulated. Coconino ended the tourney with 322 total points. The Panthers will host a meet today. Sheridan Edgewater scored 15 points and Flagstaff rolled Mingus Union in Cottonwood on Tuesday to get the regular-season schedule started again after the holiday break. Edgewater continued her strong shooting from the Nevada tournament that Flagstaff played in during the pause from the regular season. She connected on three 3-pointers and went into halftime with 13 points. The No. 27 Marauders managed just three points in the entire first half against Flagstaff (7-2, 5-0 Grand Canyon Region). Mingus fell to 3-7 overall and 2-3 in the Grand Canyon standings. Emma Doskicz recorded six points on a pair of 3s, and Gracelyn Nez, Hailey Armus and Mya Benale each contributed five points apiece to the win. Josephine Faull ended her night with seven points for the 4A Conference Eagles, who led 35-3 at the break and have now won three of their last five regular-season games. Fifth-ranked Flagstaff will host crosstown rival Coconino on Friday for a 5:30 p.m. game at Flagstaff High School's War Memorial Gymnasium. Coconino returned to regular-season play on Monday and cruised to victory behind Kiana Manuelito's 30-point night, beating the Padres in a meeting of 4A hoops teams in the Valley. Kailani Charlie added seven points for the Panthers, winners of two of their last five games. No. 23 Coconino (6-3, 3-2 Grand Canyon Region) led 35-5 at the half against 45th-ranked Marcos (1-9, 0-2 Desert Sky). Coconino moved the ball well in the victory, the team's second straight. The Panthers assisted on 20 of the 27 total shots. Kaelynn Ashley ended up with six points, and Soma Freeman added five. Maya Tijerin and Trinity Gencarelle each tallied eight rebounds for the Panthers. The No. 32 Eagles (2-6, 2-3 Grand Canyon) dropped an away game on Tuesday in Cottonwood upon returning to regular-season action. Troy Yazzie had a team-high 26 points for the Eagles, who faced a 36-22 deficit at the half. The No. 32 Eagles outscored the 21st-ranked Marauders (6-4, 4-1 Grand Canyon) 14-10 in the final quarter but the rally come up short. Marcus Crowther notched six points in the loss. Flagstaff will host crosstown rival Coconino at 7 p.m. on Friday. Basis Flagstaff won its first game of the season while at home on Tuesday, beating Mayer behind the strong play of freshman Marcus Dufek and senior Max Dittberner. The home win put Basis Flagstaff at 1-8 overall for the season. Meanwhile, Mayer remained winless overall on the loss. It was the first game for the Yeti in their new gymnasium. The Sun Sports Staff contributed to this roundup.